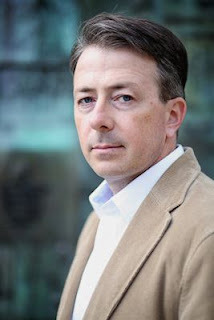 Please welcome John Renehan to The Qwillery. The Valley was published on March 1, 2016 by Dutton in Trade Paperback and in Hardcover and eBook in March 2015. John: Hi, thanks for having me. I had no idea at the time but I think I became a writer on the last day of fifth grade when we took a California writing test and I did this completely bonkers thing where anytime I couldn’t decide on the perfect word to use I would draw a little dash where the word should go and make a sort of crazy word fraction with one possible word above it and the other possible word below, then continue on with the sentence as though the reader were doing some kind of Choose Your Own Adventure, only it was Choose Your Own Sense of the Adjective or something. I think in my head I thought I was demonstrating a superior command of the language. In the testers’ heads I needed remedial English. They made me come back the morning my family was supposed to start driving to Yellowstone in our station wagon and retake the test so I could be allowed to advance a grade. As for the why, it was mostly failure at other things. I’d been a music major for the first couple years of college, and I was honestly a pretty good player but what I really wanted to do was write music for film or lead some neo-Romantic composers’ revival or something even more portentous and ill-defined. I discovered pretty quickly I didn’t have the ear to compose music. Just wasn’t in there. That was hard to swallow, but once I decided to compose words instead I realized that my whole life I’d been priding myself on being able to assimilate different styles of writing and manipulate them and blend them into my own style, the way the musicians I really admired could do with musical styles. (Even just mundane stuff. The only really good grade I got in law school was on a mock letter to a client explaining a complex legal issue in plain terms. The professor called it “brilliant,” which is the only time before or since anyone in any law-related setting has applied that term to me.) And then it only took me another 20 years to write a novel. John: In the shameful dark closet of my soul I am a craven irredeemable plotter, a GRRM “architect” running around naked trying to plan out every last thing ahead of time and avoid taking the risk of just sitting down and trying something and trusting to inspiration. Writing The Valley was utterly humbling on this score because I discovered that some of my best stuff could only come from being inside the story and trusting that it will come, or it won’t, and that’s-okay-don’t-freak-out-just-keep-trying. So I’m a hybrid now, by brute force. I know where the story’s going and exactly how the trip should feel, and I know some of the stops along the way, but I can’t let myself peek at those stops too closely because I know it will kill the better stuff that will happen if I get there organically. I am proud to say I don’t do outlines but I am obsessively deliberative and think endlessly about the story until I reach a point where I realize I am making rutted wagon tracks in my mind and stifling the chance for inspiration. Then I take myself screaming to the computer and write. That’s the hardest thing for me, just getting loose. And then I get loose and love writing, then I sleep and wake up clenched again. TQ: Tell us something about The Valley that is not found in the book description. What’s been really gratifying is that those readers, people outside the core war novel audience, have turned out to be some of my most enthusiastic. I never aspired to be a military writer per se or to occupy the public space of the (brooding motif here) “Veteran-Author,” which is a big part of why I chose an off-genre crime procedural format for my “war book.” I do want to crack some of the ossified military archetypes that dominate how Army people are presented on the page and to show them as they actually are -- regular people who wear a costume to work and are placed in extreme situations -- and I do want to present the burdens they carry in a way that’s new. But even those goals are with an eye to presenting this military world in a generalist way that upturns the conventions of military fiction. So, sure, it’s great when I hear from other military folks that they think I got the soldiers just right. But it’s better when I hear someone say, “I never thought I’d like a war book so much.” That feels like a win. TQ: What inspired you to write The Valley? John: You know, I’d been talking about writing fiction for so long it was time to write or shut up. I was out of the Army, had a full-time job with a crummy environment and toxic bosses, had a 3-year-old and a newborn in the house and was exhausted, so why not finally start your novel then? Seriously, though, it wasn’t so much whether to start writing but whether to write about war at all. I had wanted to write fiction long before I was in the military, and I was really wary of being judged as another “veteran who writes novels about war,” but I’d been reading a lot of detective fiction for the first time and realized that that format dovetailed really well with the things I might want to say about the military experience. I finally accepted that I’d been away at the circus for years and I was best qualified, at that point in my life, to write about the circus. And from there it became a sort of personal mission: to do war fiction in a way that feels completely non-genre to the reader, that addresses the themes that interest me while honoring storytelling above all, that honors the reader only as a reader, not as someone that you the Veteran-Author are in a transaction with: eat your vegetables and read my war book and feel like a good citizen. That can happen in the genre sometimes, where the author becomes the true protagonist, hiding invisibly behind the sky and never leaving the reader alone. TQ: Which question about The Valley do you wish someone would ask? Ask it and answer it! John: I’m in my basement again doing another book in the same universe. Different story, (mostly) different cast of characters. After that I want to come back to Black, my character from The Valley. I’m not done with him, and my wife wants to make sure he’s doing okay. (‘Cause seriously, Black’s a mess.) Anyway, the current thing is set in Iraq and my working title is The Run. John: Well this was delightful. I feel like we know each other. An intricate mystery unfolds against the backdrop of the Afghanistan war in this former Army Captain’s gripping portrait of a fighting division holding a remote outpost. Black didn’t know its name, but he knew it lay deeper and higher than any other place Americans had ventured. You had to travel through a network of interlinked valleys, past all the other remote American outposts, just to get to its mouth. Everything about the place was myth and rumor, but one fact was clear: There were many valleys in the mountains of Afghanistan, and most were hard places where people died hard deaths. But there was only one Valley. It was the farthest, and the hardest, and the worst. When Black, a deskbound admin officer, is sent up the Valley to investigate a warning shot fired by a near-forgotten platoon, he can only see it as the final bureaucratic insult in a short and unhappy Army career. What he doesn’t know is that the warning shot was not the worst crime in the Valley before his arrival, and his investigation will not only disturb the platoon’s dark secrets but launch a shattering personal odyssey of obsession and discovery. 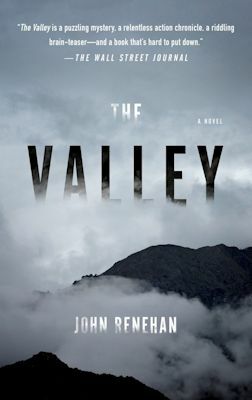 The Valley is a mind-bending mystery and a riveting tour de force that announces John Renehan as a great American storyteller. John Renehan served in the Army’s Third Infantry Division as a field artillery officer in Iraq. He previously worked as an attorney in New York City. He lives with his family in Virginia. The Valley is his first novel.